Shearwater has been an innovative company for almost 10 years and has created one of the best computers on the market with the Perdix and it’s more recent addition the Perdix AI. Now they have introduced the next step with their newest addition NERD 2. The NERD 2 is so revolutionary for not just rebreather divers, but for the sport diver alike. 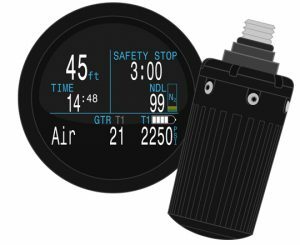 Shearwater boasts this to be the world’s first near eye remote display for scuba divers has been redesigned for enhanced flexibility and reliability. In addition to the DiveCAN and Fischer versions, Open Circuit divers can now experience the freedom the NERD 2 has to offer. The universal regulator mount allows divers to secure the NERD 2 to their mouthpiece and dive with the security of knowing their crucial dive information with a glance of the eye. This allows the diver with the combination of the Micro LCD display and the magnifying lens, all the data on the NERD 2 appears as if you were looking at a 25 inch 12 feet away. The NERD 2 offers all the great features like the Perdix in your mask display with out having to keep looking at your wrist. 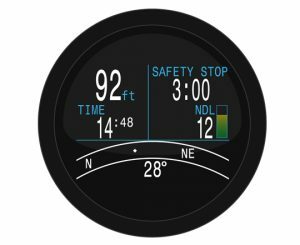 This would be ideal for Photographers or divers needing to use their hands while only having to glance at the NERD 2 to see all the information they need to have a safe and enjoyable dive. 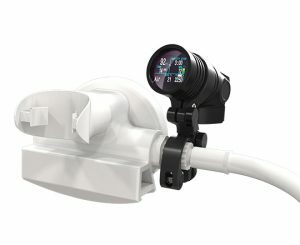 With it’s simple recharging feature and built in compass you have all you need for a dive computer that is so easy to read in any conditions of diving. You can even add the air transmitter to your regulator and it will give you your tank pressure and Gas Time Remaining. The next generation of dive computer have arrived and with Shearwater you know you are getting a high quality finished designed with great support.